The Tour de Cure® is a series of fundraising cycling events held in 44 states nationwide to benefit the American Diabetes Association. Each Tour de Cure® event has its own character and style—from unique starting points to gorgeous scenery and more! Choose your state and read more about your local Tour. No matter where you ride you’ll enjoy a fun day on your bike for a great cause. Make your training rides safer and more comfortable! The Center for Cycling Education is pleased to provide training to ride participants via our online Traffic Smarts course. Tour de Cure® riders may use the coupon code ‘tourdecure’ to receive $10 off the cost of the course. Find out more about the course here. 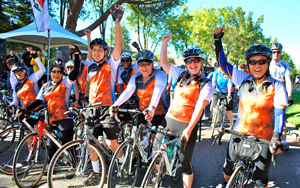 In 2011, more than 55,000 cyclists in 80 events raised more than $18 million to support the mission of the American Diabetes Association: to prevent and cure diabetes and to improve the lives of all people affected by diabetes. Sign up today and Take the Ride of Your Life! Donate to a rider or team. "I ride for my Mom who has diabetes." "I ride for my Dad who died from diabetes." 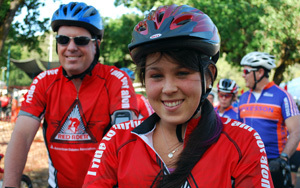 "I ride in honor of a friend that lives each day with this daunting disease." "I ride for my son who has type 2 diabetes"
"I ride to support a worthy cause!" "I ride for those with type 2 diabetes who are riding their bikes to stay healthy!" Why will you ride this year? What’s your reason? Many people will participate in the Tour de Cure® for the stimulating competition, camaraderie and physical cycling challenge, but the real reward comes in knowing that every mile we ride and every dollar we raise brings us that much closer to stopping this disease that affects over 26 million Americans. 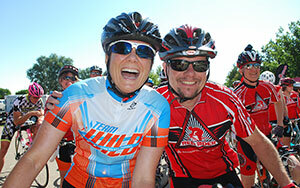 Tour de Cure® riders may use the coupon code ‘tourdecure’ to receive $10 off the cost of the course. This is an essential resource to ensure that all riders have a safe and enjoyable Tour de Cure® experience. It contains information on training, hydration, safe riding tips, and what to expect on the route. 25.8 million Americans have diabetes (8.3% of the population). 1.9 million new cases of diabetes are diagnosed each year. 79 million Americans have prediabetes. One in three children born in 2000 will develop diabetes in their lifetime. Cycling is a beneficial form of exercise that can help prevent type 2 diabetes, and can help in the management of diabetes.